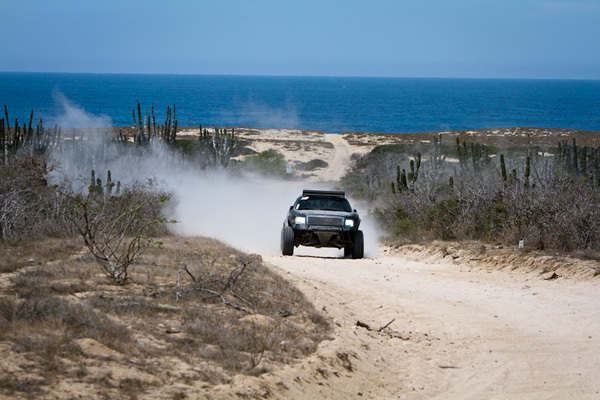 Nick Baldwin, his son Cole and Brian Nix took the Brenthel Luxury Prerunner over one thousand miles to San Jose Del Cabo Baja, Mexico during the NORRA Mexican 1000. They finished third in their class with the AC running full blast and Bob Seger blaring through the speakers. It all started when Nick decided to race the truck, built in 2010, in the NORRA 1000. Brenthel did a full prep on the truck and then put it through 300 test miles in Barstow to make sure it was perfect. “Brenthel builds some great $***,” said Nick Baldwin in his trademark candor, “We were the only truck in the race running air conditioning. I drove the whole 1200 plus miles and it was… comfortable. I want to thank Brian, my son Cole and the whole AOK crew for a great job and their great attitudes the whole way. NORRA put on a great event. Dusty, who was waving the flag at the start really pumped everyone up with her enthusiasm. We want to thank NORRA and the racers for their kind donations. We had Walker Evans and a bunch of others at Costco where we filled 17 shopping karts with food, supplies and toys for Casa Hogarorphanages.” For those of you unfamiliar with Nick’s organization AOK (Acts Of Kindness), they do random acts of kindness for strangers and contribute their time and money to help rebuild schools and supply much-needed food and supplies to orphanages and needy people in Mexico and around the world. Brenthel Industries offers the finest in CAD development, engineering, R&D and fabrication. From ground up vehicles to Desert Racing vehicles such as: Trophy Trucks, Class 1 cars, 7200 Race tucks, Class 4 cars and prerunners. With expanded capabilities in Engineering & Prototyping for Military, Defense, Border Patrol & even displays for outside companies. From start to finish Brenthel Industries takes pride in each and every build. All German Motorsports – Action-packed days and weeks!